James Martin’s recipe for cauliflower cheese, with its punchy béchamel sauce and flakes of cooked salmon, is a delicious use of leftovers. Skip the salmon for your Sunday dinner. Bring a large pan of salted water to the boil, then add the cauliflower and cook for two minutes. Drain and place in a buttered ovenproof dish. Place the butter and flour into a saucepan and heat to melt the butter. Cook, stirring for one to two minutes until lightly golden. Remove from the heat and gradually whisk in the milk to form a smooth sauce. Return to the heat and simmer for two to three minutes. Remove from the heat and beat in the egg yolks, mustard and Worcestershire sauce. Season with salt and pepper and flake the salmon into the sauce, stirring carefully. 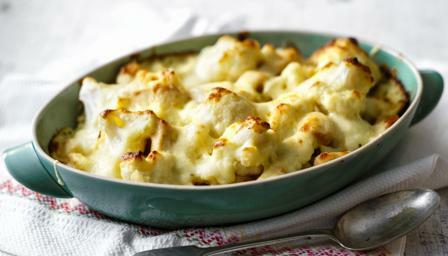 Pour over the cauliflower and top with the grated cheeses.